2.5 ton electric forklift adopts storage battery to provide power. It is well suited for those areas that need high requirements of environmental protection, such as indoor place and warehouse. This electric forklift truck has non-polluting and energy-saving advantages. It adopts drive system with independent design, low noise and high efficiency. We also select imported motor and electric control units to ensure high reliability of hydraulic parts. The lemon yellow type and silver 2.5 ton electric forklift are available for customers. TEU can customize different types of electric forklift trucks according to customers' demands. The truck body structure is compact. This forklift is simple and convenient to manipulate. The getting-on pedal and suspending seat can reduce drivers' fatigue and make them feel more comfortable. Our 2.5 ton electric forklifts have gained ISO9000 certification and CE certification. 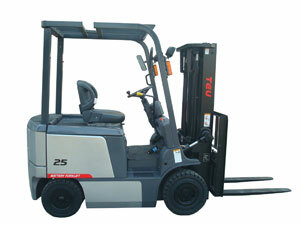 TEU 2.5T electric forklift trucks have adequate power. After each charge, they can be operated continuously for seven hours. Our company owns a technical development team who pursuits the best cost-effective products and provides high quality and timely service. Self-diagnose and high accuracy sensor reminds operators for regular service and increase safety. This electric forklift truck is suitable for indoor logistics transport. Drivers who have been trained and hold driving licenses can drive this forklift. Stable starting, steering, driving, braking and stopping are quite necessary. When we drive this 2.5 ton electric forklift on wet or slippery road, we need to slow down while steering. Check each control and alarm device before driving the 2.5 ton electric forklift. If there is damage or defect, it must be operated after repair. When this electric forklift truck loaded with material is driving, we should ensure that the cargoes are lowered and the door frame is inclined to the rear. TEU is a professional manufacturer and supplier of electric forklift trucks in China. Our company is also engaged in producing 1.5-10T diesel forklift, 2-4.5T gasoline forklift truck and 1.5-4T electric forklift. Till now, we have established exclusive selling agencies in Australia, Russia, the United Kingdom and Northern Ireland, Korea and Iran. Our 2.5 ton electric forklifts have been sold to Southeast Asia, South America, Africa and Europe.